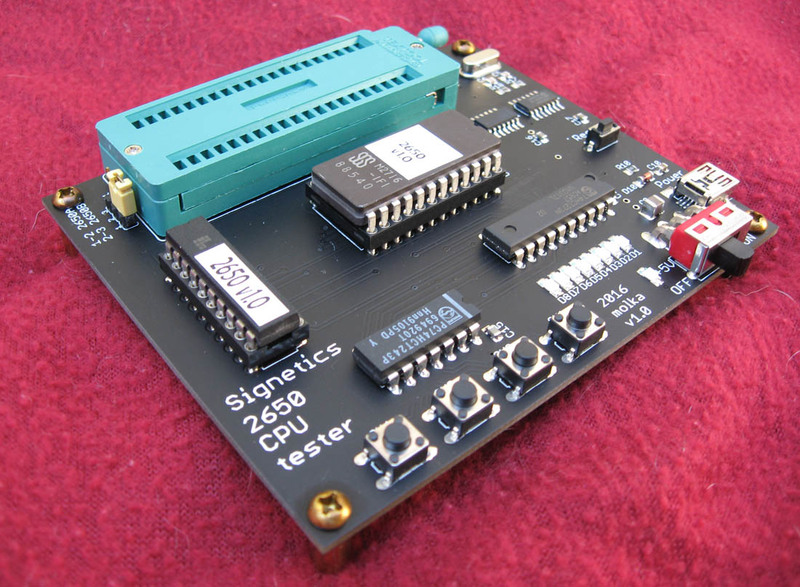 The 2650 was Signetics entry into the 8-bit market in 1975. It was hailed by some as “likely to become the preferred 8-bit device for microcomputers” as well as being very mini-computer like. It was mini-computer like but it certainly didn’t become as popular as the revier hoped, or Signetics. It did find use in many industrial computers and video games. The Signetics 2650 test board is intended to test the working condition of Signetics 2650/2650A/2650B and compatible CPUs. The 2650A added some performance and manufacturing tweaks while the 2650B is a slightly enhanced version with some additional instructions. • 40-pin ZIF Socket: For 2650 CPU – provides easy replacement of the CPUs. • 4MHz Crystal Oscillator and Divider: Generates 1MHz system clock. • FLAG LED: Indicates the signal of the CPU’s FLAG output. A 2716 2KB EPROM holds the test program. This program supports 4 push buttons as inputs, and 8 LEDs as output devices. It also provides basic and special feature test routines. **CPU is not included with the board.